Update: You can download the final paper here. Or head over onto the NYA website to vie a Voice Thread presentation with an overview of the key findings. 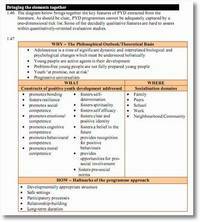 In my last Round Up post I mentioned a new research report on 'Positive Youth Development'. Well, I'm rather excited to be able to tell you we'll be having a 'research launch' for the paper on the 21st January 2008 from 10am till 12 noon at the Thistle Bloomsbury in London. I'll be co-presenting with Sarah Schulman on what Positive Youth Development is, and we'll be looking at what it has to offer the landscape of policy and provision for young people in the UK. And you are most welcome to join us. Well – that's what we were trying to explore in the paper. Positive Youth Development as a concept has its roots in US based work with young people. It draws upon ideas from the science of adolescent development to inform the design and structure of 'developmentally appropriate' programmes, activities and settings for work with young people. In the US there is a strong Positive Youth Development that is seeking to create a positive 'public idea' about youth – challenging negative attitudes towards young people and replacing them with a vision for young people as thriving members of communities. In the United Kingdom the recent Ten Year Strategy for young people referenced a number of Positive Youth Development sources when it set out a vision for young people – although the substance of the document was only an incomplete shift towards Positive Youth Development ideas. PYD ideas shouldn't be wholesale imported into the UK context – but I strongly suspect there is a lot to be gained from a deeper conversation about what they have to offer us. And it's that conversation we're hoping to make a start on on the 21st January in London. If you're interested in coming along then it would be great to see you. There will be refreshments available from 10am. To register to come you'll simply need to let ritaK@nya.org.uk know who you are, any organisation you'll be representing, and any special requirements you might have – and Rita will send you the full paper and final details of the venue. Our own work was originally based on the work of Pitman – we ‘Englishfied’ her theories about competencies & the process that young people need to make in various competencies to become successful adults. I think the positive development approach is very lacking in the current climate over here so great to see some work being done towards that. Really wish I could come to the launch – unfortunately its the date of our AGM in Derbyshire. I’ll do my best to catch up with how it goes though when we get to meet up later that week – good luck to you both & of course if we can help towards anything that comes out of your launch we’ll be very willing. Would be great to talk about this a bit when we catch up. I cross-posted a similar item over on the C&YPN blogs at http://community.cypnow.co.uk/blogs/tim_davies_on_youth_work/archive/2008/01/08/positive-youth-development-a-new-model-for-youth-policy.aspx and Tony Taylor has thrown in some interesting points – so certainly looks like we should get some good discussion going. Hey there , I would like to know more about PYD. I agree with what I have read so far. My org. is YDRF and we have developed Youth Cultural Competence (YCC) . I would love to discuss how the two could operate in harmony. We are based in Maryland and Philadelphia but we travel all over the USA. and write me back. How can I see the research paper? I am really interested in your thoughts on PYD. My research has turned up lots of stuff from the States as you say but also from Australia. My own interest is in young people growing up in rural areas and how educational psychology could play a role. It seems that the LA implementation of the DCSF 10-year strategy may have missed the point a little in that it focuses a lot on activities for young people (great) but doesn’t then make the link with how that might facilitate development, or who else might need to be involved to ensure that the links are made. It is in the DCSF paper but seems to have been overlooked a little. What are your thoughts? Previous Previous post: What analogies do you use in social media space?